The System of Rice Intensification (SRI) involves the adoption of certain changes in management practices for rice cultivation that create a better growing environment for rice crops. The use of intermittent irrigation with alternate wet and dry intervals (AWD) and single transplanting of the younger seedlings in wider spacing areas are regarded as the key factors in SRI for better crop growth and productivity. Field experiments were conducted in Chiba, Japan during the two consecutive rice growing seasons (May-September) of 2008-09 to observe the effects of SRI components on rice crop performance, field environment, water savings, and water-wise rice production. The effects of the irrigation method, age of seedlings and spacing were evaluated in the 2008 rice season with eight treatment combinations in a split-split plot design (S-SPD). AWDI at 10 day intervals and continuous flooding throughout the cropping season were the two main plot factors while the effects of seedling age (14 and 21 days) and plant spacing (30×30 cm2 and 30×18 cm2) were evaluated as sub and sub-sub plot factors, respectively. The experimental results revealed that the SRI management with the proposed AWDI can save a significant amount of irrigation water (29%) without reduced grain yield (7.41t/h compared with 7.37t/ha from normal planting with ordinary water management). Water productivity was also observed to be significantly higher in all combinations of practices in AWDI plots: 1.74 g/liter with SRI management and AWDI as compared to 1.23 g/liter in normal planting with ordinary water management. In addition, the research outcomes showed a role of AWDI in minimizing pest and disease incidence, shortening the rice crop cycle and also improving the plant stand until harvest. Synergistic effects of younger seedlings and wider spacing were seen in tillering ability, panicle length and a number of filled grains that ultimately led to higher productivity with better grain quality. Field experiments with the complete sets of SRI practices were carried out in Randomized Complete Block Design (RCBD) during the 2009 rice growing season in the same field. SRI (with 8 day old seedlings) and conventional (with 22 day old seedlings) practices were the first factor (cultivation method), while organic and inorganic managements were evaluated as the second factor (management method) in the field experiments. The highest yield was observed through the conventional method with inorganic management (6.84t/h) that was on par with the organic SRI (6.59t/h) followed by organic conventional (6.48t/h). It was recorded as 5.92t/h in inorganic SRI management. Overall, the effects of SRI components were positive and significant on a per plant basis; however, they did not differ significantly in terms of grain yield per unit area. The development of healthy and vigorous roots, increased stem diameter, greater productive leaf area, longer panicles, greater number of filled grains, development of plants tolerant to insect-pest and disease, and reduced plant lodging percentage were some notable achievements with SRI management. Water savings and water-wise rice production are other important issues that are likely to draw the attention of rice researchers and farm communities to adopt SRI under scarce water conditions. However, comparatively better grain yields with conventional management methods underscore a need for further investigations in defining an appropriate combination of practices for SRI management, considering local soil properties, prevailing climate and critical watering stages in rice crop management. Anbumozhi V, Yamaji E, Tabuchi T (1998). Rice crop growth and yield as influenced by changes in ponding water depth, water regime and fertigation level. Agricultural Water Management 37: 241-253. Ansari AA, Waleema BB (2009). Effect of agricultural chemicals on aquatic ecosystem in Guyana. Global Journal of Environmental Research 3 (1): 22-25. Anthofer J (2004). Evaluation of the System of Rice Intensification (SRI) in Cambodia (Online). Report prepared for GTZ Phnom Penh. Available:http://www.tropentag.de/2004/abstracts/full/399.pdf (retrieved: January 12, 2009). Arashi K (1956). Irrigation and drainage. In: Togari Y, Matsuo T (eds. ), Rice Culture 3. Chapter 74, Asakura Shoten, Tokyo. 191-204 (in Japanese). Association Tefy Saina (1992). Presentation technique du système de riziculture intesive basée sur le modèle de tallage de Katayama. Fanabeaza 4321`na Fampandrosoana Ambanivohitra. 31. Balasubramanian V, Makarim AK, Kartamadtja S, Zaimi Z, Nguyen HH, Tan PS, Heong KL, Buresh, RJ (2007). Integrated resource management in Asian rice farming for enhanced profitability, efficiency and environmental protection. International Rice Research Institute (IRRI), Metro-manila, Philippines. Barison J (2002). Nutrient-use efficiency and nutrient uptake in conventional and intensive (SRI) rice cultivation systems in Madagascar. Master’s thesis, Crop and Soil Sciences Department, Cornell University, Ithaca, NY. Barrett CB, Moser CM, McHugh OV, Barison J (2004). Better technology, better plots or better farmers? Identifying changes in productivity and risk among Malagasy rice farmers, American Journal of Agricultural Economics 86: 869-888. Belder P, Bouman BAM, Spiertz JHJ, Lu G, Quilang EJP (2002). Water use of alternately submerged and nonsubmerged irrigated lowland rice. In: Bouman et al., (eds.). Water-Wise Rice Production. IRRI, Los Baños, Philippines. 51-61. Bhuiyan SI (1992). Water management in relation to crop production: Case study on rice. Outlook on Agriculture 21: 293-299. Bhuiyan SI (1996). Modernization of rice irrigation systems: Implications for diversified cropping. Paper presented at the FAO Expert Consultation on Modernization of Irrigation Schemes. FAO, Bangkok, 26-29 November 1996. Bhuiyan SI, Tuong TP (1995). Water use in rice production: Issues, research opportunities and policy implications. Paper presented at the Inter-Center Water Management Workshop, 29-30 September 1995. International Irrigation Management Institute, Colombo, and World Health Organization, Colombo. Boddey RM, Bruno JRA, Veronica MR, Segundo U (2006). Biological nitrogen fixation in agroecosystems and in plant roots. In: Uphoff N, Ball A, Fernandes ECM, Herren H, Husson O, Laing M, Palm CM, Pretty J, Sanchez PA, Sanginga N, Thies J (eds.). Biological Approaches to Sustainable Soil Systems, CRC Press, Boca Raton, FL, 177-189. Bonkowski M (2004). Protozoa and plant growth: The microbial loop in soil revisited. New Phytologist 162: 616-631. Cassman KG, Peng S, Olk DC, Ladha, JK, Reichardt W, Dobermann A, Singh U (1998). Opportunities for increased nitrogen-use efficiency from improved resource management in irrigated rice systems. Field Crops Research 56: 7-39. Ceesay M, Reid WS, Fernandes ECM, Uphoff N (2006). The effects of repeated soil wetting and drying on lowland rice yield with System of Rice Intensification (SRI) methods. International Journal of Agricultural Sustainability 4: 5–14. Chaboussou F (2004). Healthy Crops: A New Agricultural Revolution. Jon Carpenter Publishing, Charnley, UK. Chapagain T, Yamaji E (2010). The effects of irrigation method, age of seedling and spacing on crop performance, productivity and water-wise rice production in Japan. Paddy and Water Environment 8 (1): 81-90. Chapagain T, Riseman A, Yamaji E (2011a). Journal of Agricultural Science 3 (3): 3. Chapagain T, Riseman A, Yamaji E (2011b). Assessment of system of rice intensification (SRI) and conventional practices under organic and inorganic management in Japan. Rice Science 18 (4): 311-320. Davids G (1998 Unpublished). Use of the capital intensive irrigation systems in rice. Davids Engineering, Inc. California, USA. Dobermann A (2004). A critical assessment of the system of rice intensification (SRI). Agricultural Systems 79: 261-281. Doebbelaere S, Vanderleyden J, Okon Y (2003). Plant growth-promoting effects of diazotrophs in the rhizosphere. Critical Reviews in Plant Science 22: 107-149. Drew MC (1997). Oxygen deficiency and root metabolism under hypoxia and anoxia. Annual Review of Plant Physiology and Plant Molecular Biology 48: 223-250. Emery RJN, Atkins CA (2002). Roots and cytokinins. In: Waisel Y, Eshel A, Kafkafi L (eds.). Plant roots: The hidden half. Marcel Dekker, New York: 417-434. Evans, L. T. 1993. Crop evolution, adaptation and yield. Cambridge University Press, Cambridge, UK. Evenson RE, Gollin D (2003). Assessing the impact of the green revolution, 1960 - 2000. Science 300 (5620): 758-762. Facon T (2000). Improving the irrigation service to farmers: a key issue in participatory irrigation management. Paper presented at the Asian Productivity Organization Seminar on Organizational Change for Participatory Irrigation Management, 23-27 October 2000, Manila, Philippines. Fujii Y (1961). Studies on the regularity of root growth in rice and wheat plants. Agriculture Bulletin, Saga University 12: 1-117 (in Japanese with English summary). Fuke Y (1961). Analysis of technological effects on rice contest yields in Japan -Hokuriku district- Tokyo Agriculture University, Tokyo. 1-74 (in Japanese). Gani A, Rahman A, Rustam D, Hengsdijk H (2002). Water management experiments in Indonesia. Paper presented In: Int. Symp. Water Wise Rice Production, IARI, New Delhi, November, 2-3. 29-37. Guerra LC, Bhuiyan SI, Tuong TP, Barker R (1998). Producing More Rice with Less Water from Irrigated Systems. SWIM Paper 5: International Irrigation Management Institute, Colombo. Gyaneshwar F, Naresh Kumar, Parekh LJ, Poole PS (2002). Role of soil microorganisms in improving P nutrition of plants. Plant and Soil 245: 83-93. Habte M (2006). The roles of arbuscular mycorrhizas in plant and soil health. In: Uphoff N, Ball A, Fernandes ECM, Herren H, Husson O, Laing M, Palm CM, Pretty J, Sanchez PA, Sanginga N, Thies J (eds.). Biological Approaches to Sustainable Soil Systems. CRC Press, Boca Raton, FL, 129-147. Hasegawa, T. 2006. Hokkaido farmers beat odds, produce successful rice strains. Article published on The Japan Times, Friday, December 22, 2006. Hashikawa U (1985). Principal Techniques for Rice Culture. Nobunkyo, Tokyo. 1-238 (in Japanese). Hashikawa U (1996). Low input rice culture. Fumin-Kyokai, Osaka. 1-366. (in Japanese). Hatta S (1967). Water consumption in paddy field and water saving rice culture in the tropical zone. Japanese Tropical Agriculture 11: 106-112. Have HT (1967). Research and breeding for mechanical culture of rice in Surinam. Agricultural Research Reports, pp. 309. Hayashi M, Hashizume A, Shinohara S, Igarashi G (1960). Studies on the influence of water-percolation in rice plants during ripening period in ill-drained paddy field. Proceedings of the Crop Science Society of Japan 29: 43-46 (in Japanese with English summary). Heenan DP, Thompson JA (1984). Growth, grain yield and water use of rice grown under restricted water supply in New South Wales. Australian Journal of Experimental Agriculture 24: 104-109. Horie, T, Shiraiwa T, Homma K, Katsura K, Maeda S, Yoshida H (2005). Can yields of lowland rice resume the increases that they showed in the 1980s? Plant Production Science 8: 257-272. Hoshikawa K, Sasaki R, Hasebe K (1995). Development and rooting capacity of rice nurseling seedlings grown under different raising conditions. Japanese Journal of Crop Science, 64: 328-332. Huang B, Scott NeSmith D (2006). Soil Aeration effects on root growth and activitiy. VI Symposium on Stand Establishment and ISHS Seed Symposium, ISHS Acta Horticulture 504. Husain AM, Chowhan PB, Uddin AFM, Rahman ABM (2004). Final Evaluation Report on Verification and Refinement of the System of Rice Intensification (SRI) Project in Selected Areas of Bangladesh. PETRRA-Project, IRRI, Dhaka, Bangladesh. Iida S, Shinmura Y, Uemori A, Kuzuna K (1990). Influence of irrigation management at the middle growing stage on rice plant growth and yield. Japanese Journal of Crop Science 59: 413-418 (in Japanese with English abstract). IRRI (2017). IRRI World Rice Statistics (WRS) - online query facility. International Rice Research Institute, Los Banos, Laguna, Philippines. http://ricestat.irri.org:8080/wrsv3/entrypoint.htm. Ishihara K, Hirasawa T, Iida O, Kumura M (1981). Diurnal course of transpiration rate, stomatal conductance, xylem water potential and leaf water potential in the rice plants under the different growth conditions. Japanese Journal of Crop Science 50: 25-37 (in Japanese with English abstract). Jagannath B, Kamath KS, Chandrappa HM, Shadakshari YG, Thyagaraj NE (1998). Optimum seedlings per unit area for high yielding rice varieties in hill zone of Karnataka. IRRN 23: 36-37. Kabir H, Uphoff N (2007). Results of disseminating the system of rice intensification with farmer field school methods in Northern Myanmar. Expl Agriculture 43: 463–476. Kamiji Y, Hayashi S, Horie T (1993). Influences of nitrogen nutrient and solar radiation in the canopy on length of lower internodes of rice. Japanese Journal of Crop Science 62: 164-171 (in Japanese with English summary). Kanda K, Kakizaki Y (1956). Population ecological studies on planting density in rice. Proceedings of Crop Science Society of Japan 25: 59 (in Japanese). Kanda Y (1997). Rice culture with sparse planting of nurseling seedling. In Nogyo Gijutsu Taikei, Field Crop 2, Supplementary Issue 19, Nobunkyo, Tokyo. 522.2-522.9 (in Japanese). Kar S, Varade SB, Subramanyam TK, Ghildyal BP (1974). Nature and growth pattern of rice root system under submerged and unsaturated conditions. Il Riso 23: 173-179. Katayama T (1951). A study on tillering systems in rice and wheat. Yokendo Limited, Tokyo. (in Japanese). Kawata S, Katano M (1977). Effect of water management of paddy fields on the direction of crown root growth and the lateral root formation of rice plants. Japanese Journal of Crop Science 46: 543-557 (in Japanese with English summary). Keisuke S, Yamaji E, Sato S, Budhiharto PS, Mizoguchi M (2007). Sustainability of System of Rice Intensification: Benefits of SRI focusing on effects of intermittent irrigation on yield increase and water savings. In: Proceeding of PAWEES 2007 6th International Conference on Sustainable Rural Development and Management, 18 October 2007, Seoul National University, Seoul, 25-37. Khalid A, Muhammad A, Zahir AZ (2006). Phytohormones: Microbial production and applications. In: Uphoff N, Ball A, Fernandes ECM, Herren H, Husson O, Laing M, Palm CM, Pretty J, Sanchez PA, Sanginga N, Thies J (eds.). Biological Approaches to Sustainable Soil Systems. CRC Press, Boca Raton, FL, 207-220. Kido M (1956). Ill-drained and well drained paddies. In: Togari Y, Matsuo T (eds.). Rice Culture 3, Asakura Shoten, Tokyo. 191-204 (in Japanese). Kira T, Ogawa H, Sakazaki N (1953). Intraspecific competition among higher plants I. Competition-yield-density interrelationship in regularly dispersed population. Journal of the Institute of Polytechniques, Osaka City University D4: 1-16. Kirk GJD, Solivas JL (1997). On the extent to which root properties and transport through the soil limit nitrogen uptake by lowland rice. European Journal of Soil Science 48: 613-621. Koyama T, Miyasaka A, Eguchi K (1962). Studies on water management in the ill-drained paddy field. VII. The effect of the surface drainage on the photosynthetic activity in the rice plant. Proceedings of the Crop Science Society of Japan 30: 143-145 (in Japanese with English summary). Krishna A, Biradarpatil NK, Channappagoudar, BB (2008). Influence of System of Rice Intensification (SRI) cultivation on seed yield and quality. Karnataka Journal of Agricultural Sciences 21(3): 369-372. Kronzucker HJ, Siddiqui MY, Glass ADM, Kirk JGD (1999). Nitrate-ammonium synergism in rice: A subcellular flux analysis. Plant Physiology 119:1041-1045. Kropff MJ, Mathews RB, Van Laar HH, Ten Berg HFM (1995). The rice model Oryza 1 and its testing. In: Mathews et al., (eds). Modeling the impact of climate change on rice production in Asia. IRRI, Los Baños, Philippines. 27-50. Latif MA, Islam MR, Ali MY, Saleque, MA (2005). Validation of the System of Rice Intensification (SRI) in Bangladesh. Field Crop Research 93: 281-292. Laulanié Henri de (1993). Le système de riziculture intensive malgache. Tropicultura (Brussels) 11: 110-114. Li XY, Xu XL, Li H (2005). A socioeconomic assessment of the System of Rice Intensification (SRI): A case study from Xinsheng Village, Jianyang County, Sichuan Province. Centre for Integrated Agricultural Development, China Agricultural University, Beijing. Liu M, Hu F, Chen X, Huang Q, Jiao J, Zhang B, Li H (2009). Organic amendments with reduced chemical fertilizer promote soil microbial development and nutrient availability in a subtropical paddy field: The influence of quantity, type and application time of organic amendments. Applied Soil Ecology 42 (2):166-175. Lunkad SK, Sharma A (2008). Combating negative impact of green revolution on groundwater, soil and land in Haryana, India. Paper presented on International Geological Congress in Oslo, 06-14 August 2008. Mao Zhi (1993). Principle and technique of water saving irrigation for rice. Wuhan University of Hydraulic and Electric Engineering, Wuhan. Mao Zhi (1996). Environmental impact of water-saving irrigation for rice. In: Irrigation Scheduling: From Theory to Practice. Proceedings of the ICID/FAO Workshop on Irrigation Scheduling, Rome, 12-13 September 1995. FAO, Rome. Mao Zhi (2000). Water-efficient irrigation and environmentally sustainable irrigated rice production in China. Paper for ICID annual meeting. International Commission on Irrigation and Drainage (http://www.icid. Martin FM, Perotto S, Bonfante P (2001). Mycorrhizal fungi: A fungal community at the interface between soil and roots. In: Pinton et al., (eds.). The Rhizosphere. Marcel Dekker, New York, 263-296. McDonald AJ, Hobbs PR, Riha SJ (2008). Stubborn facts: still no evidence that the System of Rice Intensification out-yields best management practices (BMPs) beyond Madagascar. Field Crops Research 108: 188–191. McLaughlin A, Mineau P (1995). The impact of agricultural practices on biodiversity. Agriculture Ecosystems & Environment 55 (3): 201-212. Mendoza T (2002). Impact Analysis of Organic Farming in Rice Agroecosystems In the Philippines. First RDA/ARNOA International Conference, RDA and Dankook University of Korea, November 12-15, 2002. Mimoto H (1981). Studies on rooting of rice 5. Problems associated in comparing rooting ability among seedlings with different age. Japanese Journal of Crop Science (Extra issue 2): 1-2 (in Japanese). Miyasaka A (1975). Crop management and production ecology. In: Nogyo Gijutsu Taikei, Field Crop 1, Nobunkyo, Tokyo. 277-291 (in Japanese). Moser CM, Barrett CB (2002). The system of rice intensification in practice: explaining low farmer adoption and high disadoption. In: Bouman et al., (eds.). Water-wise Rice Production. IRRI, Los Baños, Philippines. 103-118. Namara RE, Bossio D, Weligamage P, Herath I (2008). The practice and effects of the System of Rice Intensification (SRI) in Sri Lanka. Quarterly Journal of International Agriculture 47: 5–23. Namara RE, Weligamage P, Barker R (2004). Prospects for Adopting System of Rice Intensification in Sri Lanka: A Socioeconomic Perspective. IWMI Research Paper 75. International Water Management Institute, Colombo. Nemoto K, Morita S, Baba T (1995). Shoot and root development in rice related to the phyllochron. Crop Science 35: 24-29. Neupane RB (2003). System of Rice Intensification (SRI) – A new Method of Rice Cultivation. National Wheat Research Programme, Bhairawa, Nepal (http://ciifad.cornell.edu/sri/countries/nepal/nepbhrep.pdf). Nguyen HN, Hoàng VP (2005). Nghiên Cúu Hê Thônt Ky Thuât Thâm Canh Lúa SRI (System of Rice Intensification Trong Vụ Xuân 2004 Tại Thái Nguyên. Nông Nghiêp & Phát Triên Nông Thôn (Science and Technology Journal of Agriculture and Rural Development), Hanoi 3-4: 40-43. Nojima K, Tanaka I, Uemura Y (1961). Influence of drainage on the growth of rice plant in rice field. I) Effect of drainage of surface water on the growth, yield and nutrient uptake of rice plant. Proceedings of Crop Science Society of Japan 30: 321-324 (in Japanese with English summary). Oates L, Cohen M (2009). Human consumption of agricultural toxicants from organic and conventional food. Journal of Organic Systems 4 (1): 48-57. Obermueller AJ, Mikkelsen DS (1974). Effects of water management and soil aggregation on the growth and nutrient uptake of rice. Agronomy Journal 66: 627-632. Okajima H (1966). Rice development and environment. In: Agriculture Research Institute, Tohoku University (ed.). Theory and direction of development of rice production technology. Tohoku University, Sendai, Japan. 131-148 (in Japanese). Ota Y (1975). Site condition and rice crop ecology. In: Nogyo Gijutsu Taikei, Field Crop 1, Nobunkyo, Tokyo. 259-275 (in Japanese). Puard M, Lasceve G, Couchat P (1989). Etude des mecanismes d’adaptation du riz (Oryza sativa L.) aux contrainted du milieu: II -- Effets de la nutrition azotée sur la consommation d’oxygène par les racines et l’évolution de l’acidité. L’Agronomie Tropicale 44: 173-177. Rafaralahy S (2002). An NGO perspective on SRI and its origins in Madagascar. In: Uphoff N, Fernandes ECM, Yuan LP, Peng JM, Rafaralahy S, Rabendrasana J (eds.). Assessment of the System of Rice Intensification (SRI): Proceedings of an International Conference held in Sanya, China, April 1-4, 2002. Cornell International Institute for Food, Agriculture and Development, Ithaca, NY. 17-22. Rajesh V, Thanunathan K (2003). Effect of seedling age, number and spacing on yield and nutrient uptake of traditional kambanchamba rice. Madras Agriculture Journal 90: 47-49. Randriamiharisoa R, Barison J, Uphoff N (2006). Soil biological contributions to the System of Rice Intensification. In: Uphoff N, Ball A, Fernandes ECM, Herren H, Husson O, Laing M, Palm CM, Pretty J, Sanchez PA, Sanginga N, Thies J (eds.). Biological Approaches to Sustainable Soil Systems. CRC Press, Boca Raton, FL. 409-424. Randriamiharisoa R, Uphoff N (2002). Factorial trials evaluating the separate and combined effects of SRI practices. In: Uphoff N, Fernandes ECM, Yuan LP, Peng JM, Rafaralahy S, Rabendrasana J (eds.). Assessment of the System of Rice Intensification (SRI): Proceedings of an International Conference held in Sanya, China, April 1-4, 2002. Cornell International Institute for Food, Agriculture and Development, Ithaca, NY. 40-46. Reddy SB, Reddy SR (1999). Effect of soil and water management on weed dynamics in lowland rice. Indian Journal of Weed Science 31: 179-182. San-oh Y, Mano Y, Ookawa T, Hirasawa T (2004). Comparison of dry matter production and associated characteristics between direct-sown and transplanted rice plants in a submerged paddy field and relationships to planting pattern. Field Crops Res. 87: 43-58. Sato K (1956). Root development. In: Togari Y, Matsuo T (eds.). Rice Culture 2, Asakura Shoten, Tokyo. 15-27 (in Japanese). Sato S (2005). System of Rice Intensification (SRI): 3 Years’ experience of SRI practice under DISIMP. Paper for Workshop of Integrated Citarum Water Management Project, 4-5 July 2005, Jakarta. Nippon Koei Consultancy Office, Jakarta. Sato S (2006). An evaluation of the System of Rice Intensification (SRI) in Eastern Indonesia for its potential to save water while increasing productivity and profitability. Paper for International Dialogue on Rice and Water: Exploring Options for Food Security and Sustainable Environments, IRRI, Los Baños, Philippines, March 7-8. Sato S, Uphoff N (2007). A review of on-farm evaluation of system of rice intensification (SRI) methods in eastern Indonesia. CAB Reviews: Perspectives in Agriculture, Veterinary Science, Nutrition and Natural Resources. Commonwealth Agricultural Bureau International, Wallingford, UK. Sato S, Uphoff N (2008). A review of on-farm evaluations of system of rice intensification methods in Eastern Indonesia. Decentralized Irrigation System Improvement Project (DISIMP) in Eastern Region of Indonesia. Nippon Koei Company Limited, Japan. Satyanarayana A, Thiyagarajan TM, Uphoff N (2007). Opportunities for water saving with higher yield from the system of rice intensification. Irrigation Science 25: 99–115. Senthilkumar K (2002). Productivity of hybrid rice under water saving irrigation and in situ weed incorporation. M.Sc. (Ag.) Thesis submitted to Tamil Nadu Agricultural University, Coimbatore. Senthilkumar K, Bindraban PS, Thiyagarajan TM, Ridder N De, Giller KE (2008). Modified rice cultivation in Tamil Nadu, India: yield gains and farmers’ (lack of) acceptance. Agricultural Systems 98 (3): 82–94. Sarvestani ZT, Pirdashti H, Sanavy SAMM, Balouchi H (2008). Study of water stress effects in different growth stages on yield and yield components of different rice (Oryza sativa L.) cultivars. Pakistan Journal of Biological Science 11: 1303-1309. Sharma PK (1989). Effect of Period Moisture Stress on Water-use Efficiency in Wetland Rice. Oryza 26: 252-257. Sharma RN, Boonruang P, Thaipakdee S, Pookpakdee A (1999). Sustainable resource management practices on rice farming: A case of Sa See Moom, Kamphaeng Saen district, Nakhon Pathom province, western region, Thailand. Kasetsart Journal of Social Science 20: 171-180. Sheehy JE, Peng S, Dobermann A, Mitchell PL, Ferrer A, Yang J, Zou Y, Zhong X, Huang J (2004). Fantastic yields in the systems of rice intensification: fact or fallacy? Field Crops Research 88: 1-8. Shioiri M (1943). Chemistry of Paddy Soil. Extension Report for Improvement of Fertilization 5 (In Japanese). Shrirame MD, Rajgire HJ, Rajgire AH (2000). Effect of spacing and seedling number per hill on growth attributes and yield of rice hybrids under lowland condition. Journal of Soils and Crops 10: 109-113. Sinclair TR, Cassman KG (2004). Agronomic UFOs. Field Crops Research 88: 9-10. Singh CB, Aujla TS, Sandhu BS, Khera KL (1996). Effects of transplanting data and irrigation regime on growth, yield and water use in rice (Oryza sativa) in northern India. Indian Journal of Agricultural Sciences 66: 137-141. Sinha SK, Talati J (2007). Productivity impacts of the System of Rice Intensification (SRI): A case study in West Bengal, India. Agricultural Water Management 87: 55-60. Sinha SK, Talati, J (2005). Impact of the System of Rice Intensification (SRI) on rice yields: Results of a new sample study in Purulia District, India. IWMI-Tata Water Policy Research Report 47. International Water Management Institute, India Program, Anand. Statista (2017). The statistics portal – World rice acreage 2008-2016. https://www.statista.com/statistics/271969/world-rice-acreage-since-2008/. Stoop WA, Uphoff N, Kassam A (2002). A review of agricultural research raised by the system of rice intensification (SRI) from Madagascar: Opportunities for improving farming systems for resource-poor farmers. Agricultural Systems 71: 249-274. Tabbal, DF, Lampayan RM, Bhuiyan SI (1992). Water-efficient irrigation technique for rice. In: Soil and Water Engineering for Paddy Field Management, ed. VVN Murty and K Koga. Proceedings of the International Workshop on Soil and Water Engineering for Paddy Field Management, 28-30 January. Asian Institute of Technology, Bangkok. Takeda T, Hirota O (1971). Relationship between spacing and grain yield of rice plant. Proceeding of Crop Science Society of Japan 40: 381-385. Tanaka I, Nojima K, Uemura Y (1965). Influence of drainage on the growth of rice plant in rice field. 3. The influence of irrigation management on the nutrient uptake, nitrogen content in soil. Proceedings of Crop Science Society of Japan 33: 335-343 (in Japanese with English summary). Tanaka N, Arima S (1996). Effects of planting density on growth and distribution of roots in rice plants (Oryza sativa L.). Japanese Journal of Crop Science 65: 71-76 (in Japanese with English abstract). Tech Chey (2004). Ecological System of Rice Intensification (SRI): Impact assessment, 2001-2003. CEDAC Field Document. Cambodian Center for the Study and Development of Agriculture (CEDAC), Phnom Penh. Thiyagarajan TM (2004). On-Farm Evaluation of SRI in Tamiraparani Command Area, Tamil Nadu, India. Powerpoint presentation to World Rice Research Conference, Tsukuba, Japan, November (URL for presentation on SRI home page). Tsujimoto Y, Homma K, Tatsuhiko S (2009). The effects of soil drying and rewetting on rice growth in low land aquatic ferralsols in the southeastern forest region of Madagascar. Plant and Soil. Published online at SpringerLink, Berlin. DOI: 10.1007/s11104-010-0337-y. Turner BL, Frossard E, Oberson A (2006). Enhancing phosphorus availability in lowfertility soils. In: Uphoff N, Ball A, Fernandes ECM, Herren H, Husson O, Laing M, Palm CM, Pretty J, Sanchez PA, Sanginga N, Thies J (eds.). Biological Approaches to Sustainable Soil Systems. CRC Press, Boca Raton, FL. 191-205. Udyakumar (2005). Studies on System of Rice Intensification (SRI) for seed yield and seed quality. M. Sc. (Agri.) Thesis, Acharya N. G. Ranga Agriculture University, Hyderabad, India. Uphoff, N. (2015). The System of Rice Intensification: Responses to frequently asked questions. 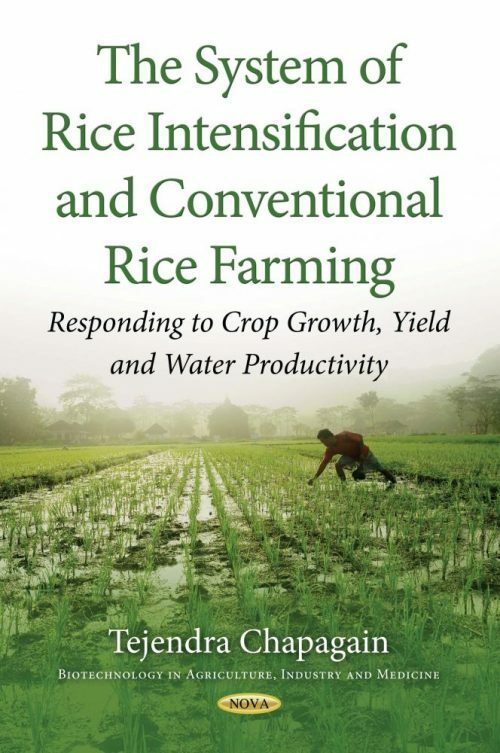 http://www.amazon.com/The-System-Rice-Intensification-Frequently/dp/1515022056; available for free at: http://sri.cals.cornell.edu/aboutsri/SRI_FAQs_Uphoff_2016.pdf. Uphoff N (1999). Agroecological implications of the system of rice intensification (SRI) in Madagascar. Environment, Development and Sustainability 1: 297–313. Uphoff N (2006). The System of Rice Intensification (SRI) as a methodology for reducing water requirements in irrigated rice production. Paper for International Dialogue on Rice and Water: Exploring Options for Food Security and Sustainable Environments, held at IRRI, Los Baños, Philippines, March 7-8, 2006. Uphoff N (2007). The System of Rice Intensification: Using alternative cultural practices to increase rice production and profitability from existing yield potentials. International Rice Commission Newsletter, Number 55, U. N. Food and Agriculture Organization, Rome. Uphoff N, Randriamiharisoa R (2002). Reducing water use in irrigated rice production with the Madagascar System of Rice Intensification (SRI). In: Bouman et al., (eds.). Water-wise Rice Production. IRRI, Los Baños, Philippines. 71-87. Uprety R (2005 Unpublished). System of Rice Intensification (SRI) Performance in Morang District during 2005 Main Season. District Agricultural Development Office, Biratnagar, Nepal. Uprety R (2006 Unpublished). Economic analysis of System of Rice Intensification (SRI) methods in Morang district of Nepal, main season, 2005. District Agricultural Development Office, Biratnagar, Nepal. Van der Hoek W, Sakthivadivel R, Renshaw M, Silver JB, Birley MH, Konradsen F (2001). Alternate wet/dry irrigation in rice cultivation: A practical way to save water and control malaria and Japanese encephalitis? Research Report 47. International Water Management Institute, Colombo. Vartapetian BB (1993). Flood-tolerant and flood-sensitive plants under primary and secondary anoxia. NATO ASI Series 116: 231-241. Vijayakumar M, Ramesh S, Chandrasekaran B, Thiyagarajan TM (2006). Effects of System of Rice Intensification (SRI) practices on yield attribute yield and water productivity of rice (Oryza sativa l.). Research Journal of Agricultural and Biological Sciences 2(6): 236-242. Vijayakumar M, Sundar Singh SD, Prabhakaran NK, Thiyagarajan TM (2005). Effects of SRI (System of Rice Intensification) practices on the yield attribute, yield and water productivity of rice (Oryza sativa L.). Acta Agronomica Hungarica 52 (4): 399-408. Wang H, Bouman BAM, Zhao D, Wang C, Moya PF (2002). Aerobic rice in northern China: Opportunities and challenges. In: Bouman et al., (eds.). Water-wise Rice Production. IRRI, Los Baños, Phillipines. 143-154. Watanabe I, Ito O, Barraquio W (1981). Nitrogen-fixing population and activity associated with wetland rice. In: Vose PB, Ruschel AP (eds.). Associative N2-Fixation. CRC Press, Boca Ratan, FL, 177-182. Yamada N, Ota Y (1961). Effect of water percolation on physiological activity of rice root. Proceedings of the Crop Science Society of Japan 29: 404-408 (in Japanese with English summary). Yamada N, Ota Y, Nakamura H (1961). Ecological effects of planting density on growth of rice plant. Proceedings of the Crop Science Society of Japan 29: 329-333. Yamamoto Y, Ikejiri A, Nitta Y (1995). Characteristics of rooting and leaf emergence rate, early growth and heading date of rice seedlings with different plant age in leaf number. Japanese Journal of Crop Science 64: 556-564 (in Japanese with English abstract). Yamamoto Y, Ikejiri A, Nitta Y (1998). Characteristics of taking root of rice nurseling seedling in relation to the changes of some inorganic and organic constituents after transplanting. Japanese Journal of Crop Science 67: 20-25 (in Japanese with English abstract). Yuan LP (2002). A scientist’s perspective on experience with SRI in China for raising the yields of super hybrid rice. In: Uphoff N, Fernandes ECM, Longping Y, Jiming P, Rafaralahy S, Rabenandrasana J (eds.). Assessment of the System of Rice Intensification: Proceedings of an international conference, Sanya, April 1–4, 2000. Cornell Intl. Inst. for Food Agriculture and Development, Ithaca, pp. 23–25. (http://ciifad. Zhao L, Wu L, Li Y, Lu X, Zhu D, Uphoff N (2009). Influence of the system of rice intensification on rice yield and nitrogen and water use efficiency with different N application rates. Expl Agriculture 45: 275–286.